American Council on Gift Annuities (ACGA) announce new rate schedule effective July 1, 2011. Laminated Gift Annuity Charts.....I have available to the first 25 individuals copies of the new gift annuity rates. It is standard paper size, laminated, two sided and list all single life rates and modified two life rates. For your complementary copy click this link and send me your complete mailing information. 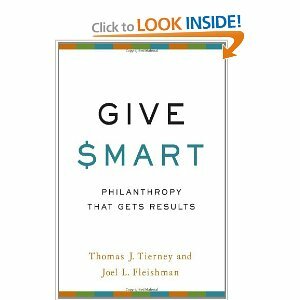 Give Smart: Philanthropy that gets results....is a new book by Thomas Tierney and Joel Fleishman. If you want Insights into the thinking of the increased number of donors who are directing significant wealth into initiatives that have a positive social impact this is the book for you. Current philanthropists have the potential to achieve real, lasting change around some of society's most intractable problems. Available from Amazon Books . Saving for the Golden Years....Where the money is!.....Over the last decade (i.e., 2001-10), the present value of assets supporting defined benefit pension plans in the private sector increased from $2.0 trillion to $2.2 trillion. Over the same period, total retirement plan assets (both defined benefit plans and defined contribution plans in the public and private sectors) increased from $11.7 trillion to $17.5 trillion (source: Investment Company Institute). Asking for Bequests.....My colleague and friend, Steve Mourning before he died last year, authored a great section in a philanthropy plan audit for a client of Jerold Panas, Linzy and Partners. Jerry Linzy finished it for the client and it has been shared on their web site. I offer it as an additional check list to see if your program includes all the key elements of a successful bequest development program. Link here. Back to Basics---Dealing with Strings and Families.....In March 2005 I wrote a short article for Planned Giving Mentor (no longer published). I had occasion recently to review the thoughts in this article for an upcoming speech. I recommend it to your reading and welcome your additional thoughts. News and Notes....A 2006 law requires most tax-exempt organizations to file an annual information return with the IRS. It automatically revokes the status for organizations that fail to file the required papers for three consecutive years. The Internal Revenue Service on June 8th said that 275,000 organizations have lost their tax-exempt status because they failed to file required annual reports for three straight years. The tax agency said it believed that the vast majority of those groups are no longer in existence, but it said it was setting up procedures to help those companies that sought reinstatement. It said the names of the organizations would be made public soon. Researchers at the Employee Benefit Research Institute (EBRI), Washington present a warning workers in the top quartile of income have about a 76% shot at having adequate retirement income if they retire at age 65, and that percentage rises to 81% for top-quartile workers who keep working to age 69, EBRI researchers say. Only 30% of workers in the lowest quartile have a 50% overall chance of having enough retirement resources. That percentage rises to 35% for workers who retire at 69, to 62% for workers who retire at age 80, and to 90% for workers who retire at age 84. There are more barrels of bourbon aging in the state of Kentucky (5,000,000+) than there are residents of Kentucky (4,314,113). Welcome new Client...Roper St. Francis Foundation, Charleston, SC. Working with Susan S. Keenan, Executive Director and her staff Connell & Associates will be further develop their planned gifts program with the development of policies, procedures, multi-channel marketing strategies and donor visits. Sharon Jones FAHP, VP Development at LifePath Hospice, Temple Terrace, Florida (now Chapters Health System, Inc.) reported the death of their largest gift annuitant at age 90/ Beginning in 1999 the single life annuitant had 17 agreements totaling $497,485. His first agreement was reinsured ($35,547) and the resulting 16 agreements had an average payout rate of 9%. The invested value of these annuities was $427,007 with a residuum value of $373,830 or 87% of the face amount. Only two agreement were made in cash the others were made with appreciated General Electric stock. Sharon recently secured a $15,000 and $10,000 single life agreements for donors age 80 and 78. The program continues to grow with a persistent and consistent effort to offer alternative gifting strategies to donors and prospects. Jessica J. McLain, CFRE, Kelly DeGregorio, CFRE (former AHP Madison Institute students) at Martin Memorial Foundation, Stuart, Florida Arthur M. "'Rusty" Brink, Jr. CFP, FAHP Vice President and Chief Philanthropic Officer, reported tremendous success based on their strong culture of philanthropy. They have secured a $2,000,000 two-life (ages 82/92) unrestricted charitable gift annuity plus a $1,000,000 two-life (ages 63/78) unrestricted charitable gift annuity in one year with their increased emphasis on alternative strategies for donor support. They have several programs that engage community volunteers who go forth and knowledgeably discuss the benefits of planned giving with their friends and colleagues.